This is book 12 of the series and is not the end. I had told a friend I'd wait until book 13 came out but I have since found out that that won't be the end either! Robert Jordan died in 2007 leaving fans in mourning, broken-hearted and wondering what was going to happen to Rand. Luckily for us, RJ partially wrote the final volume, A Memory of Light before his death but it is so long, it is being split into three volumes. 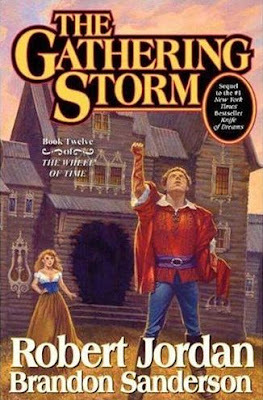 The Gathering Storm is book one of the the ending trilogy. This is NOT a series you can pick up in the middle. Nor can you let too much time lag between readings. I read books 1-5 in six weeks then had to wait for book 6 to be published less than a year later and found I had to skim over the previous books! The characters are vast and well developed. There are multiple storylines going. One fan said they had read through one storyline and when the book jumped to another, they couldn't remember what was happening. This is not a bad thing, it's just that the story is so involved I'm not surprised the final book must be three volumes. I'll be purchasing book 12 but not reading it. I'll wait for the two after it then sit down with all of them for a marathon reading session. Rand al’Thor, the Dragon Reborn, struggles to unite a fractured network of kingdoms and alliances in preparation for the Last Battle. As he attempts to halt the Seanchan encroachment northward---wishing he could form at least a temporary truce with the invaders---his allies watch in terror the shadow that seems to be growing within the heart of the Dragon Reborn himself.